The spiderweb of cracks that ruptured across the east wall of Boston’s landmark Old South Church, caused by a nearby MBTA construction project, will soon be repaired, more than two years after the damage occurred, church officials said. The repairs will require the temporary removal of more than 1,600 pipes from the sanctuary’s 1921 E.M. Skinner organ, as well as the delicate Clayton and Bell stained glass that has been in place since the building was erected in 1875, according to church officials, who detailed the multimillion-dollar restoration plans yesterday during a tour for the Neighborhood Association of the Back Bay. The work will start April 25, after Easter, and should conclude around Thanksgiving. Though the church was damaged in late 2008, the repairs had to wait until after the MBTA finished reconstructing Copley Station, because of the sensitive nature of the work and the limited space for construction staging at Dartmouth and Boylston streets. “It’s been a long time coming, and there’s several reasons for that, but we’re ready to do it,’’ said the Rev. Nancy S. Taylor, senior minister. The church on Boylston Street is one of three federally designated National Historic Landmarks — out of fewer than 2,500 across the country — flanking Copley Square, along with the Boston Public Library and Trinity Church. It was damaged during the Massachusetts Bay Transportation Authority’s $61 million modernization of Copley and Arlington stations, work done primarily to make those Green Line stops accessible to people with disabilities and to comply with federal law. The project also cracked a stone bench built into the library’s facade. 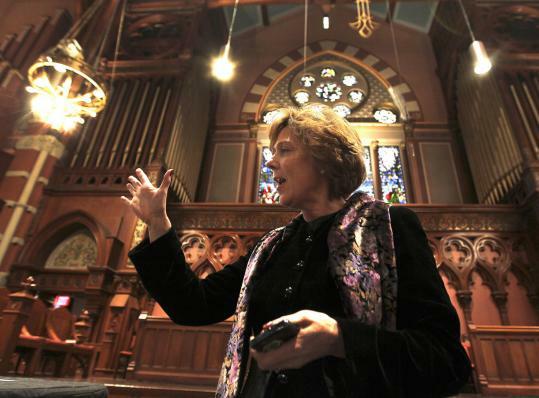 Old South Church leaders supported making Copley accessible, but worried the church might become a casualty to blasting and drilling, a concern realized in December 2008, despite MBTA assurances. But since that day, the MBTA has been an ally in trying to make Old South whole, church leaders said. T officials negotiated with insurers for their Copley contractor and subcontractor, J.F. White Contracting Co. and geotechnical engineer Hayward Baker, to cover the cost and allow the church to choose its own restoration specialists. The church agreed not to disclose the exact amount of the insurance settlement, but Burke said the cost is in the millions of dollars, including measures taken to stabilize and monitor the cracks over the last 2 1/2 years and the array of lawyers, architects, engineers, and preservationists consulted. Before the cracks can be filled permanently and the east wall repainted — technically the paint will be applied to a thin layer of canvas atop the historic paint layers — the organ pipes along that wall must be removed, to provide access and avoid damage. They will be stored and refinished by organ preservationist Jonathan Ambrosino of Boston. The elaborate stained glass sections will also be removed, for the first time since their arrival nearly 140 years ago from a noted London workshop, inspired by 15th-century English windows. At the same time, the church will pay for removal and conservation of the stained-glass windows from its more heavily weathered southern wall, along Boylston, undamaged by the T.
The stained glass will be restored by Femenella & Associates, New Jersey conservators who worked on the Princeton University Chapel, New York City’s Temple Emanu-El, and the Biltmore Estate in North Carolina. Consigli Construction of Milford is the general contractor, and Wiss, Janney, Elstner Associates, which recently worked on the restoration of the New York Public Library, is the architectural engineer for the restoration, Burke said. The removal of 1,600 east-wall pipes will diminish the organ’s bass, but leave roughly 5,000 pipes to generate sound, unlike the first three months after the cracks appeared, when the church refrained from playing New England’s third-largest organ until the plaster could be stabilized. “There will be some bass coming from the back, so we’re not totally bereft; we can still shake the room,’’ said Harry L. Huff, minister of music. To celebrate the full organ and send off the pipes in style, he said, the church will hold a free public concert on April 10 at 2 p.m. After Easter, it may not be heard again in full until the Christmas season. Taylor said everyone involved will be relieved when the church is finished, to complement the redesigned station. “Not just thrilled but excited,’’ Burke said, finishing the thought. “It will be good to get this done,’’ Taylor said.